This is a project I’m working on with Bill Logan, the creator of the FrontierSpaceTM role-playing game. This will be a module for that game designed for somewhat advanced characters. Bill created the general outline of the adventure, the star system, and the PC’s ship, but I’ve been working on a lot of the rest of the details. I suspect that as we get further along Bill will be adding in additional details and material as well. 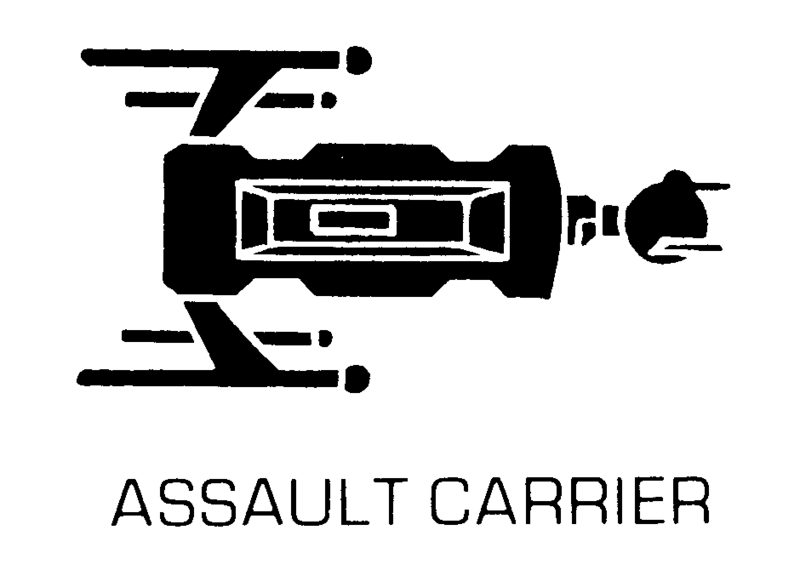 As I was writing up this outline, and the one for the Sathar Assault Carrier, I realized that while the spoiler alert icon was an interesting idea, almost everything I’m creating is for the GM side of the screen and so it is all spoilery. I’ve decided to just drop that icon and not worry about it going forward, both on this project and the others. On to the outline. A FrontierSpaceTM adventure for 4-6 characters of rank 1-2. A team of corporate troubleshooters is sent to Outpost Osiris to solve a dangerous threat. What they find may change the political, technological, and scientific landscape of the frontier forever. The Nebula Vista corporation operates the Osiris mining base in the inner asteroid belt. The miners uncovered something dangerous a few days ago and have requested help. The PCs are being sent in to investigate and assist the mining team. Outpost Osiris is a Nebula Vista Corporation mining and research base on a mineral-rich asteroid in the Duergan’s Star System. They mined deep into the rock, following unusual readings from their mining scanners. They located what they believe to be the ruins of an ancient alien starship, somehow embedded deep in the asteroid’s core. While probing its exterior, they somehow awakened it from its slumber. Its proximity defense system attacked them, and they were forced to retreat to the warehouse complex on the asteroid’s surface. They tended their wounds and sent a request to NVC for a team of troubleshooters to assist. Unknown to the miners, their discovery attracted the attention of a crew of independent scavengers who believe such a find would bring forth untold riches. The crew, commanded by Captain Thrawl, intercepted the mining outpost’s call for aid and has contacted a group of hit men on Hawthorne (the closest known NVC administration facility) to stop any departing troubleshooter team, or at least slow them down. Thrawl and his crew landed and took over operations at the facility, hoping to get as much salvaged alien tech as they could before the NVC team arrives. Thrawl explored the alien starship and found a very valuable piece of alien tech: a “phase screen” generator, but lost several men in the process of trying to decouple it from the reactor core. Hiring hitmen is a bold move for Thrawl and his kind. They’re not normally this violent unless they believe they have vast wealth at their fingertips. The scavengers aren’t looking for a fight. They will dump their prisoners and escape with a cargo bay full of looted alien tech at the first sign of an NVC ship approaching, reluctantly abandoning the phase screen generator. The activities of the scavengers have activated alien security robots which are not moving through the mining complex. The PCs will need to neutralize the robot threat, pursue Thrawl, investigate the alien ship to remove the phase screen, and fight off an attack by Thrawl and a rag-tag scavenger fleet bent on capturing the phase screen. That’s the basic outline for this project. This one is slightly different as it is a collaborative project between me and Bill. As such, I’ll only be posting what I work on here on the blog. To get all the details you’ll have to wait for the final product. Now that the three projects are laid out, it’s time to start working on the details. If you have any questions, comments, or suggestions, let me know in the comment section below. As I was thinking about this project, I realized that if you are a player in a campaign and your GM uses any of my sathar material (probably a Star Frontiers campaign), this entire project is one giant spoiler. Although if you’ve already read through my Sathar Destroyer Technical Manual, then there will only be a few new things in this project beyond the decks themselves. Those are the bits I’m going to call out with the spoiler icon in all future posts on this subject as I’m going to assume that anyone here has read the technical manual. If you haven’t read the Sathar Destroyer Technical Manual, then the following warning applies to the entire series. You’ve been warned. Now that that’s out of the way, let’s get started. This is a project in the vein of my Sathar Destroyer and UPF Assault Scout technical manuals. It will cover in detail, including maps for every deck, the interior of the Sathar Assault Carrier. 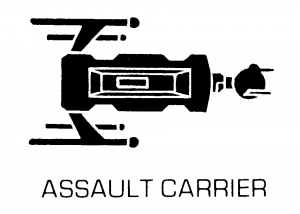 The design of the assault carrier will be based on the game stats and (roughly) the silhouette from the game rules but with my twist on how the sathar design and use their ships. In addition to the physical design of the ship I include information about how the ship typically operates and information about the larger divisions of the sathar military (beyond that detailed in the destroyer technical manual). Finally, I’ll include, either as part of this document or as a pair of separate documents, deck plans for the shuttles and fighters used by the assault carrier. I provided basic information on the shuttles in the Sathar Destroyer Technical Manual but no deck plans. I aim to correct that. I’ll also be creating a 3D model of this ship. That’s the basic outline for this project. The assault carrier is a big ship. Based on the game rules, it’s about 380-475 meters long. I’m suspecting it will be closer to the smaller end but still, that’s going to be a lot of decks to create. However, many of them will be identical but used multiple times throughout the ship. It may actually end up having fewer unique decks than the destroyer did but we’ll see how this all falls out in the end. If you have any thoughts or comments on this particular project, let me know in the comments below. This is the first of what will be the “Outline” series of posts. I’ll typically do one of these for the start of each project and possibly smaller ones for major sub-projects pieces. We’ll have to see how it goes. In these posts my plan is to lay out the basic structure of the project, identifying what will be included, what needs to be created and so forth. I’ll tag each of these outlines, along with the post related to that project with a tag to make them easily identifiable. For this particular project, the tag is “Rosegard” as is called out below. The first three outlines, for my initial projects, will probably be a bit more fleshed out than later ones since I’ve been thinking about them a bit, or in the case of this one, already mostly finished it. Or it may be that things go on, these will get more detailed as I’ll be better about thinking of things in advance. We’ll have to see. Also, these first ones won’t be open to much debate as they are projects that are fairly well along. For future projects however, I will be taking input and idea from commenters and Patreon supporters to provide direction on what is created. 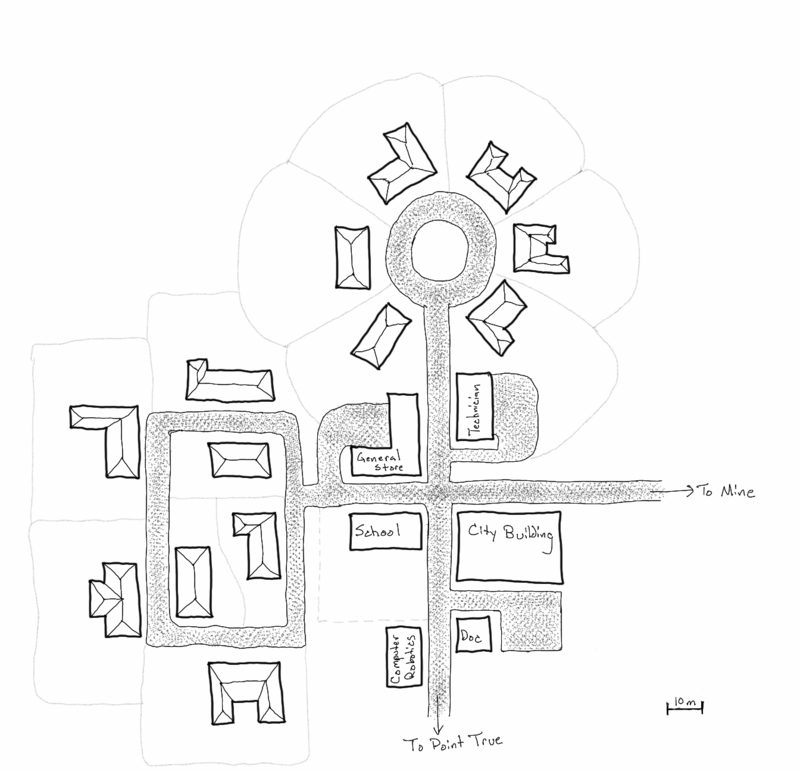 This particular project, Death at Rosegard, is an adventure I ran for my on-line Star Frontiers game and I have all the major pieces in some form, I just need to clean them up and present them. So hopefully it will go pretty quickly. That’s not true of the other initial projects and any future projects I create. An adventure for 4-6 beginning characters. This was literally written for a group of 6 brand new characters as their first adventure. 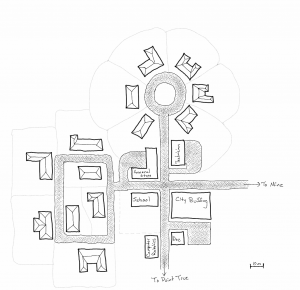 The PCs work for a mega-corp (Streel in this case) which has an arrangement with the small village of Rosegard to operate a mine near the town. One of the mining staff has been murdered and the PCs are sent to investigate. If it appears near a heading, skip to the next section. If it appears next to a paragraph or bullet item, you only have to skip that small bit. Finally, when I do a post about one of these spoiler topics, I’ll put the warning icon right at the top and that means you may want to skip the entire article. I may not always be successful in tagging everything but I’ll try. You’ve been warned. In this particular article, I think the only thing you need to skip is the Basic Story section coming up and a couple of bullet items in the “materials needed” section. One of the mine staff is a sleeper agent for the sathar and has been recently activated. He has been slowly over the past several months been “liberating” supplies from the mining facility and providing them to his sathar handler. He has been aided recently by someone from the town providing supplies as well. His actions were discovered and caught off guard, he killed the discoverer. He then disposed of the body in a way to attempt to make it look like it was done by the native fauna but that failed. And there we go, a basic outline for the adventure and a list of what is needed. Normally that “materials needed” section would be the final bit of the outline but seeing as this is the first one, I thought I’d talk about it and how it will be used. At a most basic level, that list is the roadmap for upcoming blog posts. Those are the bits and pieces I’ll need to develop (and share) as I build the adventure. The list will probably be incomplete and often a bit vague in the beginning as I’ll think of other things that need to be added along the way. It’s not my intention to come back and edit it as we go but I might do a post at the end to compare what was made to what I originally envisioned, in part to just see how it fell out and partially as a learning tool for myself to get better at planning and estimating what is involved. In this particular case, most of what is on that list already exists, either as notes, sketches, rough drafts as I have already run the adventure. We’ll be working on turning those notes and drafts into final forms over the coming weeks. What do you think about the outline format? Are there things you’d like to see included? Things that need more detail? Should I not worry about the spoiler alerts? Let me know in the comments below.